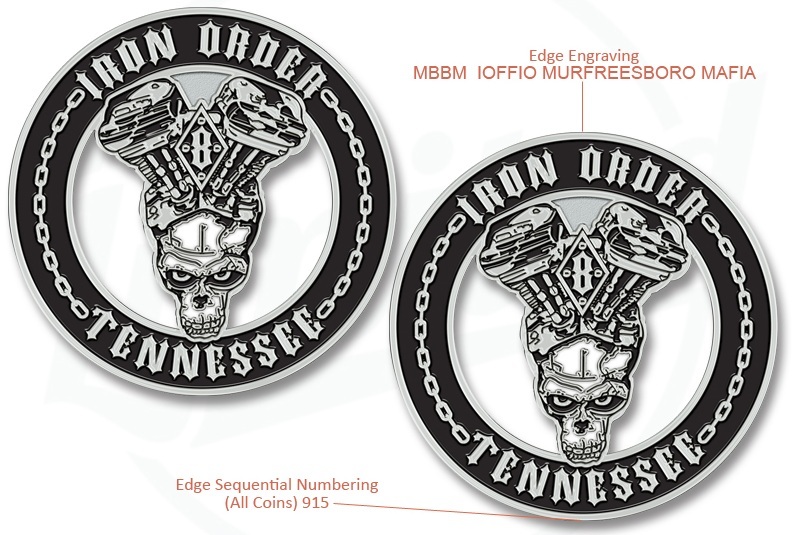 Motorcycle Club Challenge Coins – Own a Piece of the Open Road! Challenge coins are now joining the tradition of great American motorcycle clubs! Like challenge coins, motorcycles have become a fixture in American popular culture. Both embody the spirit of freedom and individuality of this great country. Motorcycles first roared into our imagination in the 1950’s. With the likes of James Dean on the silver screen and from the pages of Jack Kerouac’s “On the Road”, these chrome monsters have always been the essence of cool. As people began to ride in groups, motorcycle clubs grew in popularity. These clubs were a way for friends to enjoy the excitement of speeding down America’s highways in large groups. These groups soon became exclusive brotherhoods with clubhouses and insignias. It was not long after that choppers were the roaring representation of freedom, rebellion, and the challenge of the open road. Motorcycles brought like-minded freedom-seekers together. This shared passion for motorbikes inspired riders to create clubs. These clubs ran the gambit from the well-known “Hells Angels” to many clubs founded by people who shared other common interests or love for a particular brand of bike. Maybe the most recognized American bike of them all is the Harley Davidson. These “hogs” have been immortalized in such American classics as Hunter S. Thompson’s book Hell’s Angels. Today, with the advent of reality TV shows like “American Chopper”, the motorcycle and motorcycle club are now firmly cemented in our imagination. The challenge before us is to capture the mystique and feeling of freedom the chopper culture embodies. That’s why bikers and biker clubs began to share challenge coins. They emblazon their coins with a club logo, or an image of their beloved Harley. Either way, the challenge coins are bound to capture the spirit of the open road! Whether you are a charter member of the “Laffing Devils” or a new rider just starting out, a quality soft or hard enamel motorcycle club challenge coin will capture the thrill of riding that you seek! You club coin will become another way to show your allegiance to a specific club. It can have your name on it, as well as your club’s unique symbol. Have a new rider that you’re welcoming in to your club? There’s no better way to commemorate the event than with custom challenge coins emblazoned in rich living color with the logo of your club! Just like the patch members wear proudly on the back of their jackets, the challenge coins will become another way to show the pride you have for your club. Do you prefer challenge coins that commemorate your favorite brand of bike or favorite bike shop? No problem! The custom design process manufacturers use will help to create a coin that will leave a lasting impression! Challenge coin makers have worked for years with all branches of the United States Armed Forces, Firefighters, and other companies that want to cement the ideals of teamwork, brotherhood, and a lasting commitment to excellence. Challenge coins are a token of appreciation and respect that will stand the test of time.